But Sgt. Pepper was one that I hadn't sat down for in awhile, so I dug it up on Spotify and gave it a whirl. The first thing that stands out is the running time. This is a relatively quick album- coming in at 39:52 but the other thing that stands out is how seamlessly it all fits together. I'm assuming that was part of the whole 'concept album' thing that they were going for it, but it moves things along at a pretty brisk clip. 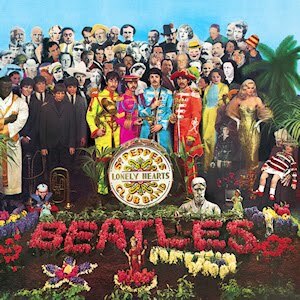 The albums opens with the title track and then moves into 'With A Little Help From My Friends' (the original far less bombastic and grandiose than Joe Cocker's cover) and 'Lucy In The Sky With Diamonds.' The opening trio are song that I'm familiar with, love and hadn't heard in awhile. So listening to them was like getting together with old friends again. The pleasant surprise was track four: 'Getting Better' which was a song that I had almost forgotten about but still worked just fine for me. (It's actually one of my favorites, because, well, the sentiment works for me. "You've got to admit, it's getting better. It's getting better, all the time." which is the kind if optimism we could use more of these days, I think.